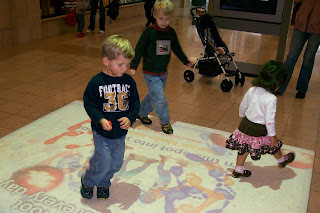 One of our regular stops when we visit The Woodlands Mall is this mat with neat projections on it. It's an advertising tool, but it has lots of fun games for kids. There are soccer games, hockey matches, cars racing around a track, and much more. It's really neat and the kids seem to enjoy it.